Engagement in video game play is an ever-growing piece of mainstream society. Given the gaming industry’s status as a multi-billion-dollar entity that has recently surpassed the popularity of the film industry by sheer numbers alone, it is inevitable that gaming and engagement in video games have and will continue to be considered a meaningful occupation to many of our patients. Engagement in gameplay despite physical or cognitive deficits not only provides a powerful and enjoyable outlet for leisure purposes, but its benefits extend beyond this when used as a rehabilitation tool by occupational therapists who are passionate and understanding of the power harnessed through the implementation of gaming. 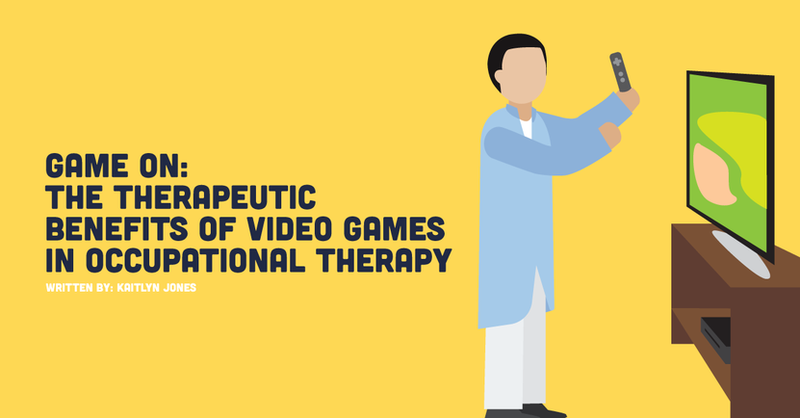 This is all to say that, as one of many emerging OT technologies, video games and occupational therapy can benefit each other in a variety of ways. This article will detail the therapeutic benefits of the use of video games in occupational therapy treatments, advice on advocating for the implementation of gaming into your practice setting, tips for acquiring gaming equipment, and some beginner recommendations on current games and consoles to get you started! Video Games: from Fun to Functional! First off, it is important to keep in mind that gaming can be categorized as a meaningful occupation in two distinct ways. The first regards patients who have, or will have grown up with gaming as a part of their daily lives (Millennials, Generation Z, and future generations). These generations of individuals and future patients grew up with a Gameboy, tablet, or console controller in hand from the time they were young enough to merely grasp the object itself and press buttons tactlessly; as such, this activity is ingrained in the culture and is a normative part of these generations’ life experience. Given this, no matter the game or game content, it is inherently meaningful to be able to re-engage in some type of gaming for these individuals as they become future patients. You simply cannot go wrong implementing some type of gaming into your treatment sessions in order to make them occupation-based when it comes to someone who has grown up gaming throughout their entire lives. The second is regarding patients who may not have necessarily grown up with gaming or technology, but will benefit from the implementation of gaming as a means of simulating a task they do find meaningful. An example of this could be having a former homemaker who sustained a traumatic brain injury engage in a cooking game on the Xbox in order to work on her sequencing, planning, and executive functioning skills required to prepare a meal without the risks associated with sharp knives and open flames during recovery. There is no shortage of evidence-based research supporting the efficacy of video game use with patients in order to promote functional gains. In general, research shows that video games offer an enjoyable and engaging series of tasks or storylines that provide immediate feedback and motivate the player to continue engagement in play through completion of personal achievements (beating your opponent, reaching a checkpoint, completing the game). Gaming requires a multitude of cognitive, physical and social demands that can all be simultaneously improved during treatment sessions when gaming is correctly and purposefully implemented in therapy. With the Nintendo Wii officially hitting its 12th year on the market since its initial release, there have been many studies on implementation of the Wii specifically with patients recovering from neurological deficits such as CVA, Parkinson’s, cerebral palsy, etc. Use those activity analysis skills! The beauty of gaming is the versatility of consoles (Wii, Xbox, Nintendo Switch, Playstation, tablets, and so on), the different games themselves, and the ability to grade a game based on difficulty level or content. What if my facility/department isn’t supporting my desire to implement gaming? The therapeutic implementation of gaming isn’t always initially well-received by those who are unfamiliar with the benefits that gaming can provide regarding patient outcomes. For many new grads, approaching a supervisor or department head regarding the novel use of technology in a typical rehab facility that has grounded their practice in the use of cones, pegs and card games can seem very intimidating. It is important to enter any conversation with a superior regarding this topic with a clear vision in mind, passion behind your desire to pursue this, and the evidence-based research backing up your requests. Next, do your research and enter the discussion with a plan in mind. In general, the original Wii can be bought for anywhere from $50-$100 online. The new Xbox Adaptive Controller (stay tuned for upcoming news on the specifics of this awesome device and how it will be a major game-changer in the OT world) will be on the market for $99 later this year. Used games for many consoles cost anywhere from $10-$50 per game. This also holds true with controllers. Many clinics even already have old gaming consoles that are not being used. Once you have a general list of equipment and costs, it is easier to talk about what kind of support or resources you are asking for from your superiors in order to put your plan into action. If funding is an issue, there are many avenues to acquire gaming equipment. Games can be found anywhere and everywhere. Typically stores like GameStop sell used equipment at lower costs. Games can be purchased used or new online. Many larger rehabilitation hospitals or healthcare networks, VA hospitals, etc. do have grant money or funding accessible for requests such as this that therapists often do not know about. Non-profit organizations are also good sources of acquiring monetary assistance or equipment donations. If your hospital works specifically with patients who have a cerebral palsy diagnosis, contacting a non-profit that is geared toward funding CP-specific causes is a good first step. Some non-profit organizations that are gaming-specific include Warfighter Engaged (Veteran Gaming), Operation Supply Drop (Veteran Gaming), AbleGamers (General gaming), Gamers Outreach (General gaming) and many more! Ultimately, it has been my experience that if you are passionate about a new approach to treatment that is backed by evidence-based research, supervisors and clinic managers are open to anything as long as the resources are readily available. The key is not being afraid to open the dialogue! I have my support and funding, but how do I actually start integrating video games and OT? For the average occupational therapist who may not know all that much about video games (a position I found myself in not too long ago), actually setting up your gaming station and choosing the necessary equipment can seem intimidating. A general rule of thumb in choosing a console if you are limited by budget to only one is: if you work primarily with younger kids or older adults, the Nintendo Wii or Nintendo Switch is a good first option. As stated previously, the Nintendo Wii can be purchased for very cheap and has an extensive variety of games. The Nintendo Switch is more expensive and does not have quite as many game options at this point in time – but the room for growth with the Nintendo Switch clinically speaking is much larger than the discontinued Wii. In general, the two Nintendo Consoles are best for these two populations because Nintendo games are generally lighter and play-based. A good example includes all of the Super Mario themed games that children typically like to play. In contrast, the Wii and Switch also have Wii Sports and similar games. For older adults, these games can simulate many of the activities or sports they once liked to do during treatment sessions. For therapists who primarily work with young to middle-aged adults in practice settings such as spinal cord injury units or traumatic brain injury units, the Xbox 360 or Xbox One may be a better fit. Xbox games require less gross motor movement than the Wii because the entire game is played with the buttons and switches of the controller and are not motion-activated like the Wii. Xbox has more options for first-person shooters or racing games that this age group typically enjoys, and recently released the Xbox Adaptive Controller for gamers with limited mobility. At the end of the day, the console or games you end up acquiring does not matter as much as the activity analysis skills required to grade the game and set up the player up for the perfect balance of challenge and success. Video games challenge us both cognitively and physically, they’re fun and bring people together, and they help us escape from the current problems we are facing during engagement in play. Video games are an incredibly powerful therapeutic tool, and have been shown to produce better treatment outcomes due to the motivation they provide. This motivation often helps a client overcome the physical and cognitive demands required to complete the game. Though it may seem intimidating to attempt to implement technology, especially gaming, into your setting as a new grad, the inherent benefits of gaming for your clients are well worth the risk of advocating for change! There are many emerging technologies and accessibility efforts to begin to follow that will help you to build your gaming arsenal – the main one being the new Xbox Adaptive Controller. Stay tuned for specific updates on the Xbox Adaptive Controller: I'll be writing a how-to guide for implementing this new piece of adaptive equipment into your clinic! Game on!